Inspired by Savannah: Disney¹s THE JUNGLE BOOK - On Digital HD August 23, Blu-ray August 30th and Returning Exclusively to Select IMAX® theatres for a Limited Time Only. 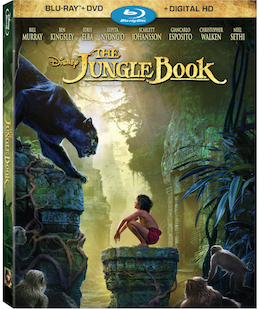 Disney¹s THE JUNGLE BOOK - On Digital HD August 23, Blu-ray August 30th and Returning Exclusively to Select IMAX® theatres for a Limited Time Only. "Audiences were mesmerized by Disney’s live-action epic adventure “The Jungle Book,” which has earned more than $949 million at the global box office to date. Critically acclaimed, Jon Favreau’s stunning live-action reimagining of Walt Disney’s animated classic, will be available early on Digital HD and Disney Movies Anywhere on August 23, and on Blu-ray Combo Pack, DVD and On-Demand on August 30. Audiences will also have the opportunity to experience the movie again at select IMAX locations for a limited time only from August 26th through September 1st." This was my favorite movie as a kid. I really need to see this new version. It looks great!